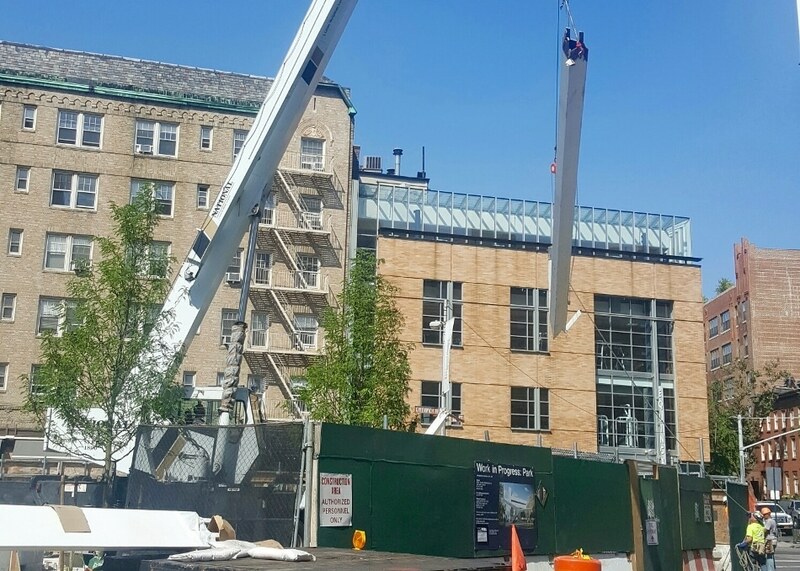 Construction of the New York City AIDS Memorial is now underway at the recently named New York City AIDS Memorial Park at St. Vincent's Triangle, located at the intersection of West 12th Street and Greenwich Avenue in the West Village. The Memorial organization expects final completion by early November, in advance of a public dedication for World AIDS Day on December 1, 2016. Steel columns for the monument's 18-foot white canopy sculpture, fabricated in Argentina, are now being assembled onsite. Stone fabricators in Cold Spring, Minnesota are currently engraving the Memorial's granite pavers, designed by world-renowned visual artist Jenny Holzer, with selections from Walt Whitman's Song of Myself. The Memorial also includes a central granite water feature and benches and will serve as the gateway to a new park that was officially named the New York City AIDS Memorial Park at St. Vincent's Triangle by New York City Parks Department Commissioner Mitchell Silver. The New York City AIDS Memorial will be the first significant public space dedicated to the AIDS epidemic in New York City. It is located at the site of the former St. Vincent's Hospital, epicenter of the local epidemic, and also a block from the LGBT Community Center where ACT UP and other heroic advocacy organizations first began. "We are excited to see onsite installation beginning on the New York City AIDS Memorial," said Keith Fox, President of the Memorial organization's Board of Directors. "After years of working with the community, local elected officials and other stakeholders to approve a design and raise funds for construction, we are extremely grateful to finally see onsite installation beginning. New York City has come so far in its fight against HIV and AIDS. We are proud to remember the 100,000+ New Yorkers who have died from AIDS and offer the community a place to remember, reflect and learn. Along with the neighboring Stonewall National Monument, this is a proud moment for LGBT historic preservation." Christopher Tepper and Paul Kelterborn, two urban planners who have never known a world without AIDS, launched a grassroots campaign to create the Memorial in 2011. Nearly 500 architects worldwide submitted designs for the Memorial during an ideas competition held in late 2011, sponsored by Architectural Record and Architizer and displayed at the AIA's Center for Architecture. The jury, chaired by Michael Arad, designer of the National September 11th Memorial, selected a winning design by Brooklyn-based architectural firm Studio AI.